iPod nano - the New Fuzzy Dice? Xbox 360 and iPod Interoperability? "The class-action lawsuit brought against Apple following the iPod nano 'scratch scandal' has crossed the Atlantic. "Seattle-based lawyers Hagens Berman Sobol Shapiro (HBSS) said yesterday they had filed a parallel complaint from UK resident Ben Jennings. The lawsuit was filed with the US District Court for Northern California." PR: People looking for an Apple iPod player or popular iPod accessory don't have to look any further than their neighborhood Radio Shack store starting today. Radio Shack Corporation announced it has agreed to become an Authorized Apple Reseller offering all variations of iPod players - including the iPod shuffle, iPod nano, and the new video-capable iPod - in its stores across the United States. The consumer electronics retailer will also continue to offer dozens of the most popular accessory items for use with iPods, such as external speakers, docking stations, decorative and protective skins, travel cases, cables and power solutions. "iPod owners already know Radio Shack as the place to go for add-on accessories to enhance their overall experience and enjoyment of these great digital devices while at home, work or on the run," said Jim Hamilton, Radio Shack's senior vice president, chief merchandising officer. "Now, this new robust assortment allows us to be a complete turnkey destination for iPod players and accessories alike." Radio Shack's 5,000 company stores and a select number of dealer stores are now able to offer customers the 512 MB and 1 GB iPod shuffle in white, the 2 GB and 4 GB pencil-thin iPod nano in black and white, and the new 30 GB and 60 GB iPod with video capability in black and white. iPods with video feature a 2.5" 260K color screen capable of displaying album artwork, photos and videos transferred from a PC, including music videos, in-season TV shows, video podcasts and other video content available for authorized downloading through Apple's iTunes service. The availability of iPod players and accessories vary by store. Players and accessories will be featured in a branded iPod section within each store where customers can compare and contrast players, as well as see and discover the types of accessories that are available to enhance the overall functionality and enjoyment of the iPod lifestyle. iPod players may only be purchased at Radio Shack stores or through Radio Shack's direct ordering system, while iPod accessories may be purchased in-store and online. Customers can visit RadioShack.com for more information on Radio Shack's lineup of iPod players and accessories as well as directions to the Radio Shack store closest to them. Hamilton said whether a customer is an iPod veteran or novice, Radio Shack's knowledgeable sales associates are ready to help fulfill virtually any need they may have, as well as explain how to get the most from their investment. "Piper Jaffray analysts say about 30 percent of iPod purchasers are now repeat buyers who are either replacing an existing, earlier-generation iPod or adding to their range of styles (such as an iPod Shuffle and a video iPod). "If the average lifespan of an iPod is about 1.5 years, what happens to the older models? "Analysts say most users hand down their iPods to friends or family once they purchase a new one. "Some simply throw them away. "Increasingly, however, consumers are capitalizing on the growing iPod phenomenon by selling their used iPods for cash or as a trade-in toward a new device." "The average lifespan of an iPod is about 1.5 years, with most hand-me-down iPods going to friends or family - some are even been [sic] thrown away. However consumers are increasingly capitalizing on the growing iPod phenomenon by selling their used iPods for cash or as a trade-in towards a new device. "According US securities firm, Piper Jaffray many iPod fans have turned to the refurbished market to track down a favourite colour or discontinued model in what is becoming an increasingly a cult-nostalgia product. "Piper Jaffray, analyst Gene Munster told Reuters, 'There is an emerging market for older iPods. Apple discontinues successful products that people feel some sort of connection to-it's the retro-cool thing.'" "Certified gadget obsessives Tech Digest and Shiny Shiny scour Gizmoville for the oddest digital goodies, Bayraider keeps tabs on the best and worst of eBay and Propellerhead answers your PC queries. "Move over fuzzy dice; not content to have the music player market - the iPod now wants to dominate the windshield. The CarClip is a clear, acrylic iPod holder designed to dangle your iPod mini or Nano from your rearview mirror - presumably making it easier for you to choose your music while you're meant to be driving. iPod video, colour, gen three and four owners don't despair - your holders are in the design stage; soon enough everyone can have their iPods at driver's eye-level, and music on their mind instead of their eyes on the road." Link: iPod nano - the New Furry Dice? PR: According to a study released by the Consumer Electronics Association (CEA), portable MP3 players rank as the most wanted gift among teens this holiday season. Seventeen percent of teenagers in the study selected the device as a desired gift, a 9 percent increase over 2003. Video game consoles, computers, portable gaming devices and cell phones rounded out the top five on teens' technology wish lists. "With portable music players in high demand and the next generation of video game consoles set to launch, teens are clear about what they want this holiday season," said Sean Wargo, CEA's director of industry analysis. Teens also named digital cameras, game peripherals and portable CD players as potential gift items. Beyond consumer electronics products, the study results showed that teens remain consistently interested in clothes, CDs and video game titles as gifts they wish to receive. "CDs in particular stand out as a reminder of the remaining importance of the shiny disk format as the preferred medium for music, despite the strong growth of online music services and teens' predilection for MP3," said Wargo. "While many teens continue to buy tracks online, it's clear that they also continue to rely on CDs to fill their hungry portable devices and music appetites." MP3 players also top the list of gifts teens expect to give this holiday season. Nearly 60 percent of teens who will buy at least one consumer electronics item reported that they may choose an MP3 player as a gift. According to the survey, nearly half of teens (47 percent) plan to pay for all or most of the gifts they plan to give this season with their own money, which may come as a welcome surprise for parents. Older teens, who are more likely to have part-time employment, show higher self-funding. In addition, the number of teens who report that they'll purchase gifts online is 43 percent, up from 40 percent in 2003. CEA's 2nd Annual Youth Holiday Purchase patterns survey was administered via telephone interview to a random national sample of 502 U.S. teens 12 to 17 years of age between October 20 and 23, 2005. It was designed and formulated by CEA Market Research, the most comprehensive source of sales data, forecasts, consumer research and historical trends for the consumer electronics industry. The complete study is available free to CEA member companies. Nonmembers may purchase the study for $499. "Apple's iPod Click Wheel has been selected for a UK usability award. "Apple's iPod took the prize for best consumer product." "If you play 'Project Gotham Racing 3' on an Xbox 360 after the console hits stores later this month, Microsoft invites you to use tunes straight off your iPod as an alternative to the game's sound track. "Officially, the company says the new console can stream music from just about any MP3 player. But during a preview of the next-generation console in San Francisco last month, Microsoft execs talked up the interoperability between iPods and the Xbox 360." PR: Analysys International gives a prompt comment on Apple's recent launch of its iPod with the function of video play and provides the strategies for its success. Apple introduced its new iPod to the market, which has a breakthrough feature of the ability to play video contents like teleplays and movies besides its basic functions of storing music and graphics. Analysys International says that the purpose of Apple's launch of this iPod is to probe the market. It is impossible for the video iPod to achieve the success iPod had achieved before obstacles of technology, contents and cooperation methods to be removed. Analysys International suggest that Apple should a) increase HD capacity, enlarge screen size, and make technical improvements in video data transmission and download; b) try harder to attract more movie providers to provide diversified contents as well as considering to let more video program providers get involved, or even to establish strategic alliances with content providers or adopt other better partnerships; and c) adopt flexible policies regarding pricing strategy. Analysys International is a leading Internet based provider of business information about technology, media and the telecom industry in China with the mission to help their clients make better business decisions. They provide data, information and advice to 10,000 clients worldwide, representing 1,500 distinct organizations, deliver over 150 consulting engagements a year, and hold more than 20 events that draw in over 8,000 attendees. Their clients include executives from companies like technology vendors, vertical information technology users, as well as professionals from professional service companies, the investment community and government agencies. iSongBook, the newest portable music system from Tivoli Audio, is designed to fit all Apple iPod models, including the latest ultra-slim nano and newly introduced iPod. The iSongBook the new "Universal Docking Station" from Apple, made to fit all iPod models. The flip-down dock charges the iPod while it plays, without the need for an additional dock connector, and stows into the unit when not in use. The supplied remote control operates both the iPod models and the iSongBook. The new iSongBook features a highly sensitive digital AM/FM tuner for clear and precise reception with a 9k/10k switch for AM reception outside North America, as well as an adjustable, telescoping FM antenna and built-in AM antenna. Stations may be tuned manually or via 5 AM and 5 FM favorite station preset buttons with a "seek" function to automatically search for signals in any country around the world. "The iSongBook is so versatile as a traveling music system for the iPod that it has a universal docking station that will perfectly fit all current iPod models, regardless of size," says Tom DeVesto, Chairman and CEO of Tivoli Audio. "With the iSongBook, the iPods becomes a full-bodied music system, unlike any other." 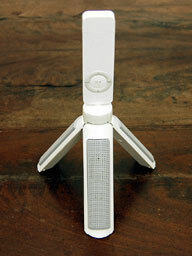 The white with silver faceplate design makes the iSongBook a perfect match for the iPod. It also features an "on demand" blue backlit LCD display that shows the station tuning as well as the digital clock, whose functions include alarm and 20-minute sleep timer that can be set to wake to an iPod as well as radio. Auxiliary input and stereo headphone output are positioned in the rear, complete with rubber covers to protect them from the elements, dust and dirt when not in use. It comes with a detachable matching secondary speaker for stereo sound, a 6' audio cable for proper room positioning with rewind mechanism for cable management, and optional carry bag. The credit card sized remote controls the iPod when docked, as well as the iSongBook. The iSongBook features a built-in battery charger and operates on standard AA alkaline or NiMH/NiCad rechargeable batteries or by an included AC adapter or 12V power source. It also includes seven dock adapters for compatibility with the Apple iPod mini, iPod photo, and other earlier generation iPod models. The iSongBook is sized to fit in a suitcase, briefcase, or backpack, measuring just 6-3/16" H x 11-1/16" W x 2-3/16" D for the clock/radio with the slave speaker. The patent-pending iSongBook is housed in a sealed cabinet with rustproof hardware for weather resistance. It retails for $329.99 at distinctive retailers, or direct by calling toll-free to 877-297-9479 or online. 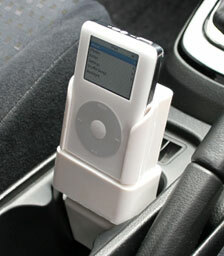 PR: TuneCup is an iPod car accessory for your iPod 5G, iPod 4G, iPod 3G, or iPod mini. It comes complete with audio out to connect your iPod directly to your car stereo or you can use cassette adapter (not included) to listen to your iPod through an in-car cassette tape deck. TuneCup also includes an S-video port for a crystal clear connection to an in-car AV system. Perfect for watching videos on the new iPod 5G or photos on any of the other color iPods. The TuneCup cradle has an adjustable slider on each side that fits all current iPods including mini, 3G and all 4G, photo and iPod 5G models (14.5mm - 19mm). The ball joint is adjustable so that you can position your iPod for easy access. PR: Newer Technology, Inc., has immediately available an Audio Cassette Adapter that allows you to play your iPod tunes on the road and crystal clear for $14.99. The RoadTrip! FM Transmitter and RoadTrip!+ already have won the ears of many reviewers and customers. The cassette adapter is made with the same principle in mind - make taking your tunes on the road easy, affordable and enjoyable. "Our RoadTrip! and RoadTrip!+ work for a large segment of the population, but for those who don't have a 120v jack available or who just prefer to use a cassette adapter, we have made it affordable and plug-and-play," said Larry O'Connor, president of NewerTech. The Audio Cassette Adapter works with any model of Apple's iPod but also with any audio device with a headphone jack. Simply plug the adapter into the headphone jack of your audio device, insert the tape into your car's tape deck and push play. Now sit back and enjoy commercial-free music you know you enjoy - because you put it there. Visit Newer Tech online for more information, to find a dealer, or to purchase this or any of the awesome RoadTrip! products. PR: BoomTune mini incorporates a unique tripod design and an amazing 1W x 2 output that is surprising for such a compact size. Just one AAA battery is all you will need to enjoy up to 10 hours* of playback. With a style like you have never seen before, the tripod design can be used with almost any MP3 player from the small iPod shuffle to the iPod 5G. It is also suitable for more than just table top use. In fact, you can use it anywhere. Whether you are staying in a hotel, camping, at a barbeque, or just enjoying the outdoors, BoomTune mini will ensure that you can enjoy your favorite tunes no matter where you are! To enjoy your music with your friends, all you have to do is plug in your MP3 player and press play, open out the legs of BoomTune mini and switch it on. The low energy design will allow you to rock on and on and on. *Battery life may vary depending on environmental conditions. The BoomTune mini series are perfectly suited for the new iPod 5G so you can enjoy your movies, music videos, and video podcasts with friends. PR: Use with your iPod and nano too. This is a cool little sound system. Sits on a table top, music sans ear buds. AAA battery power with off-on switch to turn off the battery when you are not using it. Sound is good quality. It is not for noisy environments. PR: Belkin TuneCommand lets you roam and play your tunes from virtually anywhere in your home, delivering the flexibility and convenience that iPod users desire. Using wireless radio frequency technology, the TuneCommand Remote works from up to 150 feet away, regardless of barriers such as walls, ceilings, or windows that limit traditional remotes. Connect your iPod to headphones, your home entertainment system, laptop, or computer-even if you stash it away in the glove box, control of your iPod remains at your fingertips. TuneCommand includes a multi-clip, surface-mount hook and lanyard, providing a variety of options for securing your Remote on the road, in the car, or at home. 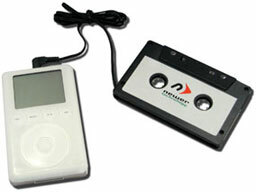 It features eight basic functions: play/pause, next track, previous track, volume up and down, shuffle songs, and repeat. 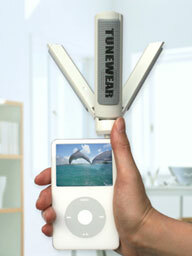 When used with the iPod photo, TuneCommand lets you scroll through your slide shows or presentations-wirelessly. This product is not yet available. Please check back soon for updates on availability of this and other products Belkin has in development. Or become a registered user and you will automatically receive updates on all Belkin product releases. PR: This hand-oiled leather stitched case is an exclusive item designed by Marty Flint to keep your new nano protected and looking awesome. Each has a dark silver texture made out of words, blended onto the black leather for an urban but grungy feel. Besides being 100% leather and looking amazing, this case was designed to keep it's shape even when the nano isn't inside. It's also got an opening at the bottom so you can easily slide your nano in and out of it's holder! Because they are hand textured, each pattern will vary slightly. The photo shows an example of the basic pattern, front and back. PR: Kiwali LLC has announced a preview of the Kiwali NanoDeco Fashion Faceplates for Apple iPod nano. The NanoDeco is a collection of exciting designs intended to dramatically enhance the look and appeal of the iPod nano. "The NanoDeco is a natural follow-up to our exciting ShuffleDeco collection" said Paul Lee, Director of Marketing for Kiwali LLC. "We have a totally new set of very hip and sophisticated designs that will allow users to personalize the look of their iPod nanos." "Actual availability of the Kiwali NanoDeco is expected in December," Lee continued. "But we wanted to preview the collection now to give the designs a chance to speak for themselves." Like the Kiwali ShuffleDeco, NanoDeco provides limited protection from scratches and everyday hazards and is easily removable. The Kiwali NanoDeco will be a set of two rigid "faceplates" that cover the face and back of the iPod nano through the use of a removable adhesive. 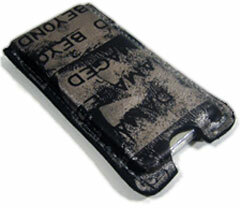 The NanoDeco is designed to work with many other iPod accessories and cases. Kiwali LLC is previewing the NanoDeco collection on its website. Visitors to the website can participate in an online poll and vote for their favorite designs. Actual availability is expected to be in December and pricing will be determined at a later date. Reseller and distributor inquiries are welcome at this time. For more information, please visit the website. I wanted to be able to listen to the songs on my iPod for some time now. This is because I don't want to fill up the hard-drive of my iBook with music, but be able to access my Music when I'm on the way. I found some solutions but none really made me happy. Then I found mt-daapd which did exactly what I wanted except for one thing. mt-daapd can export any folder as an iTunes-music-share. The missing piece was, that it doesn't detect if an iPod is connected. So I wrote a simple program that detects if an iPod is connected and then automatically shares it with mt-daapd. Add ShareIPod to your login-items to automatically start it every time you login. If you want to share your iPod to your whole network, add the ports to your firewall (TCP). PR: WCITIES, leading provider of travel and destination content, has released their latest travel product: Pod CityGuides. Now you can download a guide to hundreds of cities as easily as you download your favorite music. Pod CityGuides is the source for the coolest clubs, hippest hotels, trendiest restaurants, top attractions, and hottest events in more than 300 cities around the globe. With the handy Pod CityGuide you can customize your travel itinerary with the same ease and convenience that you program your iPod. When you use the Pod CityGuide, you can forget your calendar because the personal event guide keeps you up to date with the coolest events including concerts, sports, theater, festivals and museums, in cities across the USA and around the world. You can get tickets for these events at http://www.wcities.com . Pod CityGuide even includes movies and show times provided by MatchFlick.com. "WCITIES Pod CityGuides are an essential travel resource," says Fraser Campbell, WCITIES Vice President. "It is part of WCITIES continuing innovation to make our city content entirely portable, and available for the active traveler regardless of their devices: mobile phones, PDA, Blackberry, and now the increasingly popular iPod." Pod CityGuides can be personalized with the WCITIES TravelBag, letting users customize their download. TravelBag enables users to select the clubs, restaurants, events, they want to keep track of and take with them. WCITIES has a whole suite of downloadable travel products. The CityGuide lets user get an entire city's worth of content, and the Pocket CityGuide includes full mapping and navigation. Compatible with the world's most popular devices, WCITIES content can be downloaded for Nokia, Sony-Ericsson, Palm Treo, HP iPaq, and dozens of other brand names. Go to http://store.wcities.com for more information. PR: Starting immediately, Zoom and Go.com, the multimedia website featuring traveler videos and in-depth hotel reviews, will make its entire library of video clips available to Apple video iPod users. With a collection of approximately 10,000 high-quality videos, Zoom And Go.com boasts the Internet's largest collection of video clips shot by travelers around the world. "We're the only consumer travel site offering this kind of rich media content," said Jonathan Haldane, CEO and founder of Zoom And Go.com. "With the new video iPod and Zoom and Go's unique content, travelers can create a portable and personalized video travel guide for any destination. "Wherever you're heading, you can download dozens of Zoom and Go clips onto your iPod, so other travelers can give you face-to-face advice on where to stay and what to do before you go, or even while you're walking the city's streets," Haldane said. Zoom and Go.com is the first website delivering its complete video collection to iPod users. Current clips range from on-camera hotel reviews and insider advice about tourist attractions to tips from travelers on-camera about the best hotel beds and finding bargains overseas. Zoom And Go will have video for most major destinations and hotels by the end of this year. Users can download Zoom And Go videos onto their iPods by clicking on the Download to iPod link beside each clip. Travelers can upload their videos from digital cameras or digital video cameras and have other travelers watch them on their iPods. PR: ThinkFree Office 3 Show, iPod Edition uses the iPod as a USB hard disk. The software, once installed, loads directly onto the memory of a computer from the iPod. The user can then utilize the host computer's screen and keyboard to create or edit the slides. Slides, after being edited, are saved to the iPod, not to the hard drive of the host computer. Unplugging the iPod leaves no trace of slides on the host computer. An iPod that contains both the presentation file and the ThinkFree Office 3 Show, iPod Edition can be plugged into a USB port of any Mac or Windows PC for further editing. A separate "Export to iPod" menu in ThinkFree Office 3 Show, iPod Edition converts slides to JPEG format and uses Apple's iTunes software to move the slide images to photo database on the iPod. These JPEG images are used for viewing slides on the iPod. The same images are also used for running slide shows by connecting the iPod to an external monitor or a beam projector. This features is only available on iPods with color display. Although iPod nano can show slide shows on its color screen,it cannot be connected to an external monitor.